2016 Teen Choice Awards Photos, News, and Videos | Just Jared Jr.
Ross Lynch & Laura Marano Reunite at Teen Choice Awards 2016! It’s an Austin & Ally reunion! 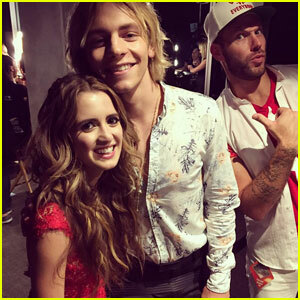 Stars Ross Lynch and Laura Marano ran into each other while backstage at the 2016 Teen Choice Awards held at The Forum on Sunday (July 31) in Inglewood, Calif.
Laura‘s mom Ellen posted the cute photo on her Instagram account. “Ross and Laura with Johnny @teenchoiceawards,” she captioned the pic, with stylist Johnny Wujek photobombing in the background. Check out more gorgeous pics of Laura below! Christina Grimmie‘s family is reportedly responding to the lack of mention at the 2016 Teen Choice Awards. Christina was honored with the Choice Web Star: Music award at the show, but wasn’t mentioned during a segment about violence, which was introduced by Jessica Alba. 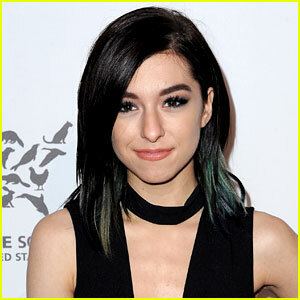 Christina passed away earlier in the summer after being shot in an act of violence. Tyler Posey Skateboards Backstage at the Teen Choice Awards 2016! Tyler Posey shows off his skills while hanging out backstage at the 2016 Teen Choice Awards held at The Forum on Sunday (July 31) in Inglewood, Calif. The 24-year-old Teen Wolf star visited the Backstage Creations Retreat the ACTON Blink Boards and some other goodies. 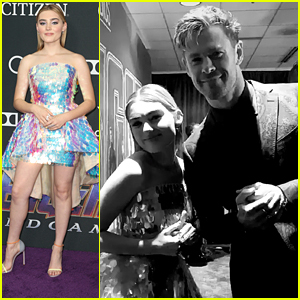 Also stopping by the suite that evening were host Victoria Justice, Bunk’d star Skai Jackson, The Fosters‘ Sherri Saum, Riverdale‘s Madelaine Petsch, Black-ish actress Marsai Martin, Modern Family‘s Nolan Gould, dancer Chloe Lukasiak, and Fuller House stars Soni Nicole Bringas and Michael Campion. FYI: Victoria wore J Brand jeans. Forever in Your Mind & Hey Violet Hit the Teen Choice Awards 2016 Carpet! Forever in Your Mind look super cute as they arrive on the carpet at the 2016 Teen Choice Awards held at The Forum on Sunday (July 31) in Inglewood, Calif. 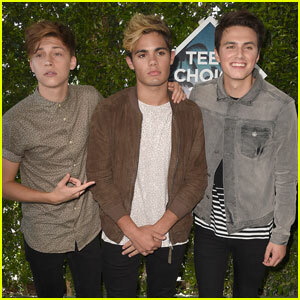 The guys – Ricky Garcia, Emery Kelly, and Liam Attridge – were joined on the carpet by fellow groups Hey Violet and New District. “Happy 3 years baby #3yearsofFIYM @OfficialFIYM,” Ricky tweeted that day. Also in attendance that night were Dance Mom star JoJo Siwa, Kendall Vertes, and Kalani Hilliker. FYI: The guys of FIYM are wearing AllSaints jackets, shirts, and boots. Victoria Justice slayed her hosting duties at the 2016 Teen Choice Awards on Sunday (July 31) in Inglewood, Calif. The 23-year-old actress joined John Cena for the night and after amazing us with her red carpet look, completely floored us with all her stage looks. From her wrestling outfit (a complete custom look with Doc Marten boots), to the DVF turtleneck dress which gave us major 1960 vibes and the color-her-wonderful Death By Dolls two piece with Stuart Weitzman shoes — but then, THEN, she came out in our favorite look EVER! How fantastic did Victoria look in the velvet H&M dress, that was paired with Stuart Weitzman shoes, Marrin Costello earrings and LaFonn ring?! Victoria was styled by Madison Guest, with hair by Laura Polko and glam from Lusine Galadjian. Derek Theler couples up with Chelsea Kane on the carpet at the 2016 Teen Choice Awards held at The Forum on Sunday (July 31) in Inglewood, Calif. The 29-year-old Baby Daddy actor was hoping to take home a surfboard tonight for the show. 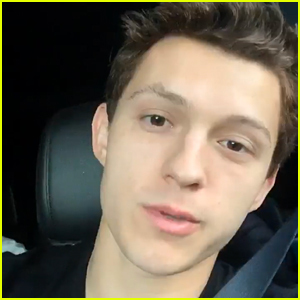 It was up for Choice TV: Liplock (him and Chelsea), Choice TV: Scene Stealer (Tahj Mowry), Choice Summer TV Show, and Choice Summer TV Star: Male (Jean-Luc Bilodeau). “So cool being nominated for 2 Teen Choice Awards. Too bad we didn’t bring home the surfboard!” Derek wrote from Instagram. Longtime couple Audrey Whitby and Joey Bragg are also pictured below. So cool being nominated for 2 Teen Choice Awards. Too bad we didn't bring home the surfboard! FYI: Derek wore Timberland boots. Chelsea carried an Edie Parker clutch.